A week of celebration and remembrance honoring Knute Rockne brought worldwide attention to South Bend, Indiana, 75 years ago this week. The legendary Notre Dame football coach had died in a plane crash nearly a decade earlier, in March of 1931, and his life and legacy mesmerized a nation in the ensuing years. On Oct. 4, 1940, “Knute Rockne All American” celebrated its world premiere at all four South Bend theatres — the Colfax, Granada, Palace and State. Thousands filled the streets. On Oct. 4, 1940, the movie “Knute Rockne All American” opened its world premiere at all four downtown South Bend theatres – the Colfax, Granada, Palace and State. Thousands of local residents swarmed Michigan Avenue to get a glimpse of the assembled Hollywood stars, including the leading roles Pat O’Brien (Coach Rockne), Gale Page (Bonnie Rockne), Ronald Reagan (George Gipp), and Donald Crisp (Rev. John Cavanaugh, C.S.C.) along with Reagan’s wife Jane Wyman, Bob Hope, Irene Harvey, Allan Jones, and others. Warner Bros. Pictures had spent years planning the film and working with Notre Dame and the Rockne family to reach agreement on the particulars of the project. Notre Dame was a reluctant participant, concerned about the emphasis on football above academics. Bonnie Rockne also had some very specific ideas about how she wanted her late husband portrayed – as a family man, not someone consumed by football. Famously, Notre Dame would not allow a Hollywood film to be made on campus until nearly a half-century later, with the filming of Rudy. Among the actors considered for the role of Rockne were Spencer Tracy, Paul Muni and James Cagney. Tracy was under contract with MGM, which would not release him to play in a Warner Bros. picture. Cagney might have gotten the role had it not been for his support of the anti-Catholic Loyalist cause in the Spanish civil war; the University, it was said, nixed his bid for the role. In the end, it is hard to imagine anyone handling the role better than O’Brien, who took great pride in achieving the famous coach’s distinct look and sound. It didn’t hurt that O’Brien had played some football at Marquette University High in Milwaukee, where he had met Tracy, who became a lifelong friend. O’Brien also had a part in convincing Warner Bros. to hire Reagan for the role of Gipp. The little-known Reagan lobbied extensively for the role, and when he got his chance to audition, it was with O’Brien himself, not a stand-in as would usually happen. Reagan traded on his role as “The Gipper” for the rest of his acting and political career. 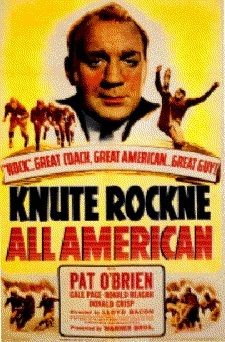 Robert Buckner wrote “Knute Rockne All American”; two years later, Buckner received an Academy Award nomination for writing the screenplay for Yankee Doodle Dandy. Lloyd Bacon, a well-respected director whose credits included 42nd Street, was the director. Bacon replaced the original director William K. Howard, who was rejected by the studio over creative differences. Pat O’Brien played the role of Coach Rockne. Production on the film began in Hollywood in March 1940, with some of the exterior shots being filmed at Loyola University Marymount, where Rockne’s great friend and protégé, Tom Lieb, served as football coach and athletic director. Lieb guided the Fighting Irish to several key victories in 1929, when phlebitis knocked Rockne out of several games and practices. In May of 1940, the crew came to Notre Dame to film several scenes. Numerous Notre Dame students and professors served as extras, and the Moreau Choir performed for key scenes. In July, plans for the premiere events in South Bend began to take shape, after South Bend Mayor Jesse I. Pavey, Notre Dame vice president Father Cavanaugh, and business manager Arthur Haley traveled to Hollywood to meet with Warner Bros. executives. “This group began to function during the first week in September, when a National Knute Rockne Week organization was set up with headquarters at the Oliver Hotel in South Bend. The entire promotional campaign centered around National Knute Rockne Week which was celebrated September 29–October 5, with the four-theater World Premiere of “Knute Rockne-All American” on October 4, as the climax of the events. The premiere then became truly national in scope…. “After weeks of high-powered publicity and exploitation engineered from Hollywood, New York and South Bend, two “South Bend Specials” carrying over 150 notables, including Hollywood stars, newspapermen, celebrities and Warner Bros. officials, left from Los Angeles and New York, the two sections meeting in Chicago where they joined forces and proceeded to South Bend…. “The streets were jammed with thousands of people, making the flow of ordinary traffic virtually impossible. All hotels were filled to capacity and many local residents offered their spare rooms to accommodate as much of the overflow population as possible. 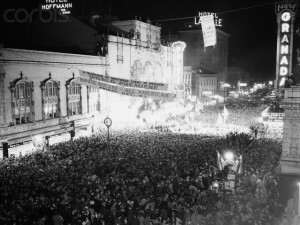 The town was thoroughly bantered with likenesses of Rockne and notices about Knute Rockne Week and the Warner premiere. “When the special arrived in South Bend, it was greeted by a wildly cheering throng while two bands played the Notre Dame Victory March. Mayor Pavey had set aside the day as a civic holiday, and greeted the Warner contingents from the station platform. The entire town cooperated to the fullest. Leading merchants and industries banded all their facilities. The town had the appearance of being under martial law, with hundreds of policemen and state troopers attempting to keep order. “Escorted by motorcycle policemen, the party pushed through the crowds at the station and went to the Oliver Hotel headquarters. The Vox Pop program held its regular broadcast over the CBS network with Wally Butterworth and Parks Johnson conducting as usual, from the lobby of the Hotel, with the stars as guests. “That evening the stars and celebrities attended the gala banquet in the Notre Dame Dining Hall. Bob Hope was master of ceremonies of the proceedings. Among the speakers on this program were Pat O’Brien, Franklin D. Roosevelt, Jr., who read a letter from the President to Mrs. Bonnie Rockne, Father O’Donnell, president of Notre Dame, Postmaster General Frank C. Walker, and many other prominent personages…. “On Friday, October 4, the stars, guests, officials and press attended the civic luncheon at the South Bend Country Club. In the evening, the Kate Smith broadcast was aired from John Adams High School in South Bend. Miss Smith had transported her entire troupe to the site of National Knute Rockne Week activities, and devoted her program to the premiere. It was broadcast over the coast-to-coast Columbia network. Mrs. Rockne, the Notre Dame Band and choir participated in the broadcast, as did Pat O’Brien, Gale Page, Ronald Reagan and Donald Crisp who took part in a radio adaptation of scenes from the Warner film. In addition to her Friday evening program, Kate Smith gave six daily newscasts from South Bend on her noonday spot over the entire Columbia network. Saturday, Oct. 5, brought a fitting end to Knute Rockne Week, as the assembled dignitaries arrived at Notre Dame Stadium, where the Fighting Irish entertained the College of the Pacific, coached by the legendary Amos Alonzo Stagg, then 78 and in his 50th year of coaching football. Stagg was one of the major influences on college football while head coach at the University of Chicago from 1892-1932, where his Maroons captured the attention – and passion – of a young Chicago resident named Knute Rockne. Coach Elmer Layden’s Irish defeated Stagg and his Pacific Tigers, 25-7. For more on the award-winning book, Coach For A Nation: The Life and Times of Knute Rockne, click here.